Luke was born and raised in Canterbury, England. He fears change, loves not following trends, needs so much to be loved, likes being cosy, and is intense. Since leaving school as soon as he could in 1994, Luke has spent most evenings playing piano in Canterbury's pubs and bars, and the rest of his time writing his own songs. Some of these songs appear on long-playing albums, or CDs, as they are now called. The first two of these CD releases were recorded in Luke’s bedroom, with Dave the Drummer playing in the background. The third one was recorded on an old reel-to-reel tape machine in a wooden hut by the sea, a few miles down the road from his bedroom. This one featured more musicians playing in the background. Luke always knew that if ever he was to form a band around his music, there was only one name for them. And so it was that he called this band ‘The Feelings’. That was 2004. The shot to fame in 2006 of chart-topping prog-pop group ‘The Feeling’ rather took the edge off things. This is a sore point with Luke. So if ever you meet him, it’s best not to bring it up. Around the same time as he was recording his third CD, Luke started putting on a weekly cabaret-style evening of his own music and more, in a candle-lit ballroom in the centre of Canterbury. These nights were called ‘Luke Smith Presents…’, and became very popular, pulling capacity crowds. Special guests began to come along to play on these nights, some of whom were quite famous. Punk legend Wreckless Eric, Hollywood songwriter Jill Sobule, and English torch-singer Philip Jeays, for instance. At the end of 2006 though, Luke made the rather arch decision to fold ‘Luke Smith Presents’ at the height of it’s fame, and the beginning of 2007 saw Luke choosing just to play mainly low-key, intimate local gigs for a while, as well as staying in a bit more, to record at home, and generally work on his enigma. Luke took the end of 2007 and the beginning of 2008 to record a single, which sounded very funky and featured a brass band on the B-side, but which then sat on Luke's shelf for well over a year, while Luke teased people by occasionally mentioning it, and then not releasing it. It became a much fabled object of desire. History became legend. Legend became myth. It was the single that wasn’t. Meanwhile, in March 2008, Luke briefly returned to the same old candle-lit ballroom from before, for a 7 month residency called 'An Evening In, With Luke Smith & The Feelings'. He was BACK! And THIS time he was, well, pretty much the same as the last time actually. Except, there was now an added slideshow, extra biscuits on the tables, extra lamps, and a slightly augmented band line-up. Then, between the winter of 2008 and the summer of 2009, Luke made quite a few new recordings with the Feelings, some at home, and some at intimidatingly ‘proper’ studios. Luke decided to set up his own label to release what he thought to be the best of these recordings. He called his new label Storm In A Teacup Records, and the new recordings finally came out on this label as two EPs in the very first week of 2010, as did that mythical long lost single. These releases were the first of Luke’s to be made commercially available as digital downloads, and at this time, Luke’s back catalogue was re-released in the same futuristic fashion. The shimmering doorway of digital destiny had beckoned, and Luke had shuffled nervously through it. It was quite a moment. In the summer of 2010, Luke & The Feelings returned to Canterbury’s live scene, beginning a new weekly residency in the Cherry Tree, a cosy six hundred year old pub which was very dear to Luke, since he had spent a stint of his booziest years working behind the bar there. 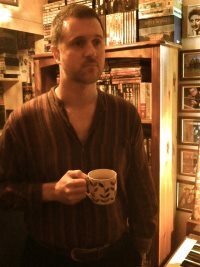 In February 2011, Luke celebrated the amorous bliss of Valentine’s Day by releasing a wistful new EP on Storm In A Teacup Records, featuring a title track about being a love-lorn loser. A few times a year, Luke gets all adventurous and goes to Oxford, where lots of other people like his music. He is a regular performer at a music festival there, called TRUCK. Some famous fans of Luke's music include 60's psychedelic godfather Arthur Brown, folk singing legend Julie Murphy, P J Harvey & Red Hot Chilli Peppers’ guitarist Josh Klinghoffer, New York 'Antifolk' pioneers Lach and Thomas Truax, and Caravan front-man Pye Hastings. Luke has supported such artists as The Kinks’ legend Ray Davies, Squeeze's singer/lyricist Chris Difford, American songstress Suzanne Vega, Welsh singing starlet Katherine Jenkins, New York’s celebrated lyrical luminary, Jeffrey Lewis, and eccentric English troubadours John Otway & Wild Willy Barrett. Critics have favourably compared Luke to the following artists; Ian Dury, Jonathan Richman, Robert Wyatt, and the mighty Chas & Dave. Luke has performed many times on the radio (BBC 6 Music, BBC Radio London, BBC Radio Kent, Virgin Radio). Luke's songs would love to be heard by even more people, as it gets them out of the house. Luke would like this for them too. All of Luke's songs are heart-felt. Here are some reviews and feature articles about Luke. So often, the little things in life go unnoticed and unobserved. There's so much we take for granted, so many mundanities of day to day life we automatically absorb without stopping to think about what they actually are and what they mean. Of course, by the time we realise how important these little things are, they're gone. Canterbury's Luke Smith, with his band The Feelings - a name coined way before their atrocious singular namesake blasted their way into mainstream consciousness - is a master of transforming the commonplace and the unremarkable into something stirring and romantic. Whether it's spending cosy days inside with the curtains shut, ruminating on the smallest insecurity, not wanting to go out to parties anymore or, of course, agonising over the small matter of unrequited love and personal relationships, Smith's incisive lyrics turn the ordinary into the extraordinary, elevating those little things into matters of utmost significance with poetic grace - and just the smallest hint of neurosis. I've Had My Chance pontificates over the inability to flirt when the opportunity presents itself. Set to a jaunty, jazzy, piano-based upbeat pop tune, Smith's self-deprecating - and very English - observations - "Her heart was there, within my reach / When I just lost the power of speech / Oh any normal bloke would just have pounced / But no - not me!" - are permeated with a wistful melancholy that will strike a chord with anyone who's ever loved and lost (or, in this case, just lost). As much inspired by the poetry of John Betjeman and Brian Patten as the lyrics of Jonathan Richman and Stuart Murdoch, I've Had My Chance shines both lyrically and musically as an ode what could, should and would have been. It rings true with astonishingly humorous and tragic accuracy. A Truck Festival favourite, Luke Smith has been making wonderfully honest and charmingly lo-fi music for years. He's an incredible pianist, a maestro on guitar and he sings with poetic poignancy and tender wit about human insecurities and the banalities of everyday life. More akin to a musical John Betjeman than to Kate Nash, tonight his talent is undeniable and irresistible. One of 2007's most touching, charming gigs. Plan B magazine's J Capeling wrote this for 2007's summer festival guide. at Oxforshire's sell-out indie festival TRUCK. Champion of the socially baffled, Luke is scarcely spotted outside of his hometown of Canterbury; for him to travel this far is a rare treat, reserved for Truck. Simultaneously chirpy yet glum, naïve yet prim beyond his years - as quintessentially English as a nice cup of tea, Victoria sponge and a spot of Countdown. And you'd guess that would be his idea of a good time. Anti-Folk's answer to Eric Idle, by jingo. From bbc.co.uk/collective's Truck festival pick, 2006. Long regarded as "the beating heart of Truck", the bearded, lo-fi anti-folk troubadour from Canterbury wears his heart unashamedly on his sleeve. The man who claims he's as much a fan of John Betjeman as Jonathan Richman pulls few emotional punches with songs such as I'm Intense, I Fear Change and I Need So Much To Be Loved. Altogether now - ahhh. From Sweeping The Nation's, Truck Festival special. It's the sound of the crowd through a lot of Luke Smith's set tonight. This is the problem with the QI Bar as a venue. It's a nice little bar with its comfy seats and drinks in over-sized test tubes but it doesn't lend itself to being a good gig environment. Tonight's show is in a very small side room with no door just off the main bar. This presents a couple of problems, there's no way all the people who want to see the show can get in (all of 20 lucky people do) and the noise from the main bar drowns out any quieter moments of Luke's set. Most people probably won't feel in too much of a position to complain, admission fees having stopped being taken when it became impossible. The situation could have been worse though, as Luke planned an acoustic set tonight, before Dave the drummer became available again at the last minute. An upside of the relaxed atmosphere is that we get just over an hour of Luke playing selections from his three albums. Luke and his songs are the epitome of reserved Englishness, the antidote to overblown rock n roll and he's a keen observer of the minutiae of daily life and the worries it brings. All the old favourites are played and while 'Luke's National Anthem' provides a high point, songs like 'You'll Never Stop People Being Gits' prove he's still got it. Tonight's star turn is Luke Smith, ably assisted by his dad, Dave, on drums. Judging by the lyrical content of his songs, Luke is one of life's less fortunate people. Going on the talent he shows, he's far from unfortunate. Despite looking like a latter day Chas and Dave, the keyboard playing is in the vein of Ben Folds and the vocals are reminiscent of Ian Dury's cheeky chappy wordsmith. It's a combination that works suprisingly well. The excellent rapport with the small crowd (handing out badges, muso jokes, self-deprecating humour) brings a great warmth to a performance which rounds the night off wonderfully. Luke Smith sings at the piano, with his Dad on drums. As if this weren't reason enough to love him, he tinkles out an hour of wry, funny, sincere songs about his quiet Canterbury life, all infused with a nervous charm. Musically it's not complex, with echoes of music hall singalongs and simple 70's pop, but it's performed with more than enough jazzy dexterity and aplomb. It's hard to describe what makes Luke such a great prospect. Phrases like "catchy ditties", "homely honesty" and "subtle drum accompaniment" could be employed, but they call up such horrors as Chas 'n' Dave, or Richard Stillgoe. I suppose that Luke is a little like that, but imagine a parallel universe where Snooker Loopy is an elegant and moving anthem. Can't? You'd best go to the next Luke Smith gig, then. In a country chronically hamstrung by its collective awe of pointless pageantry and its deluded and seemingly endless embrace of deadening ’lad’ culture, Luke Smith is as welcome as a truckload of nuts at a squirrel convention. Blending an ear for melody that was surely honed in a previous life as a Victorian Music-Hall emcee with a simple, touching and utterly unique lyrical turn of phrase, Smith is an unsung hero in the purest sense of the cliché. Whilst almost umbilically bonded to his hometown of Canterbury, the music that rises out of Luke Smith’s piano will strike many a chord. If you consider yourself too brash for Belle and Sebastian, too old for Blink 182, too happy for Bonnie Prince Billy or too cool for Busted, you may have found your man. It may have been Ben Folds who memorably stated, ’you’ don’t know what it’s like / being male middle class and white’, but it’s Luke Smith who elocutes it the best. With song titles such as ’Saturday Job’, ’I Love Not Following Trends’ and ’What’s He Got I Haven’t?’, the pain and disillusionment expressed by Smith is all too real for many people. Whilst it is sometimes expressed with an archly raised eyebrow, this is merely a realisation of the sad reality of self-expression in our gravely cynical times. Whilst stating he ’tries not to consciously fit into any particular tradition’, Luke does have a clear sense of where his heritage lies. He traces his music back through the great white British groups of the 60’s, whilst also bringing elements of the ’catchiness and poeticism of the old American standards’. He also mentions how the work of John Betjeman ’set his heart on fire’, which is an interesting connection to a very real Englishness that separates him from so many. It would be easy to criticise Luke Smith on the grounds of extended idiosyncrasy, but he clearly views this undeniable side of his character as a virtue. When questioned on his views with regards to being consciously ’within’ or ’reacting against’ a tradition, he makes the excellent point (which is not made enough) that whilst the idea of a tradition appeals to people by suggesting a sense of belonging or validation, it does risk stifling idiosyncrasy and individualism. However easy it may be to shut Luke into a box and hammer a sign on saying ’Do Not Open unless in need of wry piano driven musings on the British condition with a side order of dry humour and a dessert of new male angst’ (there have been more ridiculous genres in the past), the genius at work here is a perfect example of what Smith characterises as ’good individuals having good individual ideas’. It is indeed a rare and precious thing. A true point of reference for those still waiting to be initiated into Luke’s world is his ultimate desire to bring as much of himself into his music as possible. Where singer-songwriters such as Will Oldham and Coner Oberst will introduce you to their dark world where all light is shut away, the world of Luke Smith is a somewhat lighter affair. This is as much a testament to the man and his country as it is to his music. When asked to talk about influences, he cites Edward Hopper’s memorable quote that the greatest influence on his own work was himself. By itself the utter pretentiousness of the quote would be enough to merit the ritual burning of all Luke Smith replica dolls and other merchandise, but when coupled with the knowledge it was also used by Tony Ferrino, he just about gets away with it. It is impossible to see Luke Smith grow any bigger than a much loved cult figure, largely due to his lo-fi techniques and his occasional, unfortunate overtones of Chas ’n’ Dave or other cockernee bleeders with their old Joanna’s, but there is definitely an audience for him out there. He likes to think that he could appeal to Americans, to be seen as ’an exotic fruit’. When you consider the UK bands that have seen success in the States recently (mostly Coldplay and Franz Ferdinand), the tie that binds them hardest is the way they are uncompromisingly British in their sound, so perhaps the red underbelly of the US might appreciate another esoteric, weirdo Brit. So, if you are currently lacking a guiding musical voice, you could do worse than turn to a quirky, different, Krazy, Jesus look-a-like from Canterbury. Yes; every single one of those adjectives would have me running for the hills as well, but don’t. A world obsessed with war, Bush, triumph and disaster needs a steadying hand. Luke Smith is not that hand, you are, but, if you ever feel the need for a steadying hand of your own, you know where to turn. He also looks a bit like Atlas the Greek you know. from Kent On Sunday’s feature on Luke Smith, summer 2005. The catchphrase of Luke Smith’s first album was "It’s Not Wrong, It’s Just Different", and both Luke and his music are different. His long hair could imply that he is a rock musician, but he is philosophical, intelligent and expresses himself through eccentric English pop. Luke would never sell his soul and make music he was not proud of. His deepest emotions and angst fill each song. Maybe his latest album could be third time lucky, where commercial success is concerned. He certainly deserves it. Has anyone got Radio 2’s ’ number, where "different works"? The term "anti-folk" assumes a prior knowledge of Folk music, a prior knowledge which had lead the artist to react against the genre. Lach (who many say invented anti-folk) saw it more as an intensification of the form, making it more immediate, very much like punk was to rock. So enter Luke Smith Canterbury’s "Anti-folk anti-hero". Never heard of him? Despite three albums on Beautiful Jo Records (which also houses some other lovely folk-pop acts if you’re into that, check the label out)? Neither had I until I moved to Canterbury where he is a local hero. Believed to be umbillically attached to his hometown he’s not likely to be appearing in a venue near you anytime soon. For years Luke Smith has been a shiny pop beacon, a life raft, in a sea of mediocre poppunkemoindiecore bands (with awful names, you know who you are "Chicks Dig Scars"!) that populate this pretty city. Luke purveys beautifully Piano driven melodies which are kept simple and perfectly frame his witty, poignant lyrics. Very much in the vein of (lazy comparisons but) Morrissey or David Gedge his lyrics focus on the banal, the excruciating nuances of daily life that both keep us going and wear us down. Much like his influences his vocal exploration of the "Kentish Condition" (coined), his wit and his attention to tiny details creates an instant rapport with the audience, we’ve all been in the situations Luke sings about (Cliché, but true) especially because he manages to keep the melodrama to a minimum. Luke is not abjectly miserable; he is a paragon of the malaise of small town ennui, the minor depression that comes with a lack of a girlfriend etc. Making such "trivial" parts of life exciting or beautiful is a difficult task, or perhaps Luke just illuminates what was already there? His vocals are soft, dulcet Kentish tones, which strain perfectly over higher notes aptly demonstrating the frustration and misanthropy that dwells within the lyrics. Lastly just listening to Luke on the Myspace URL will not give you a sense of the total Luke Smith experience, his live show is phenomenal. Firstly there is the real sense of familiarity between Luke and his audience, guests who frequently appear from the crowd to join him on vocals, sax or bass will then slink off stage back to the bar, I believe, though it has never been crystallised that his resident drummer "Dave" may also be his dad. There is a real folk communal vibe to his shows. Besides this his musical flexibility is showcased by various covers and improvised music which are peppered throughout his show. His onstage banter with the crowd and his backing band never seems rehearsed, never grows tiresome and helps to make his live show exactly that, a show rather than your average gig. For me he is much like Jonathan Richman, the American proto-punk hero, his songs may, at first glance, appear to be simple, throw away pop ditties. On closer inspection, though, what you will find are songs in the key of life, about all the important unimportant things that make us who we are, Luke really is an undiscovered gem in the great tradition of intelligent English song-writing and I hear he really likes tea.